Ralph L. Bagley (ca. 1914-2008) with his paintings. Bagley was an artist and instructor who taught in Central Florida from the 1950s until his death in 2008, when he was 94 years old. 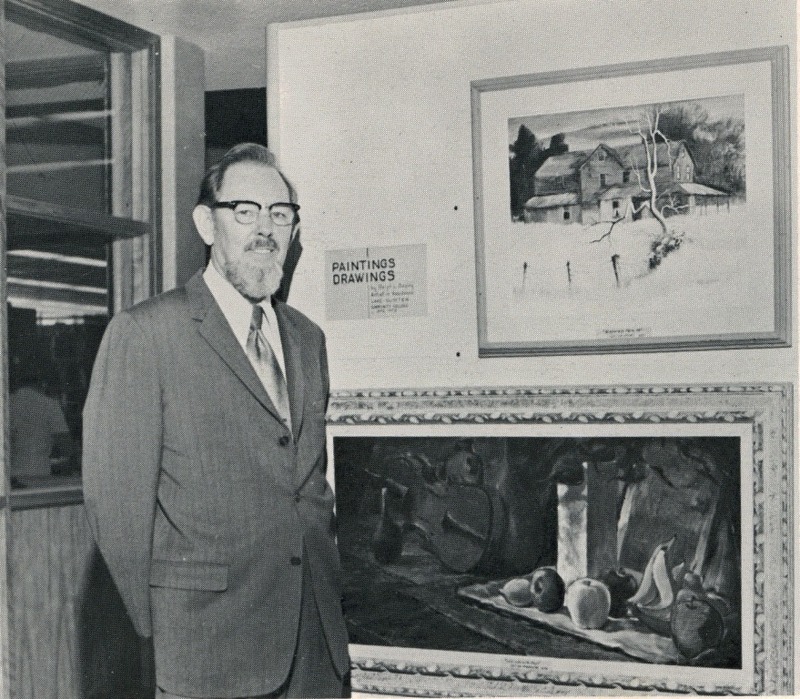 He was born in Bertrand, Missouri, and attended the Flint Institute of Art in Flint, Michigan, continuing his studies in New York and Washington, D.C. Bagley and his wife, Marianne Bagley, moved to Orlando, Florida in 1950, where Bagley founded the Orlando Institute of Art, the city’s first fine-arts school. 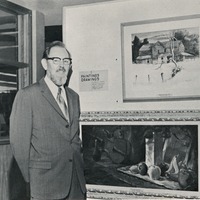 Bagley depicted landscapes, still lifes, and portraits in a variety of media, including oil, watercolor, and charcoal. Original black and white photograph: City of Orlando Terrace Gallery, Orlando, Florida. Copyright to this resource is held by the City of Orlando Terrace Gallery and is provided here by RICHES of Central Florida for educational purposes only. Finley, Gabrielle. "stressed creativity among students." The Orlando Sentinel, January 13, 2008. http://articles.orlandosentinel.com/1993-11-28/entertainment/9311300709_1_picasso-guernica-religious-art-painting. “Ralph L. Bagley.” RICHES of Central Florida accessed April 23, 2019, https://richesmi.cah.ucf.edu/omeka/items/show/5381.